As a person who does a lot of talking for a living, there are a couple of aphorisms that I learned a long time ago that are helpful to me yet today. Words, like eggs, are tender things. Which ones you’ll have to eat. These rhymes came to mind as I watched the uproar over the comments made by Miami Marlins’ manager Ozzie Guillén that landed him in hot water with that city’s Cuban-American community. For those who aren’t aware, Guillén made a comment to a Time Magazine reporter expressing his admiration for Cuban dictator Fidel Castro. The mere mention of the name is explosive enough, but to express admiration for the despot is suicidal. Guillén spent nearly an entire day remorsefully apologizing to Miami’s Cuban-Americans both in Spanish and English. 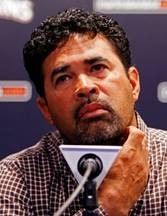 He has been suspended for five games by the Marlins. I happen to be a huge baseball fan, which explains somewhat my interest in this story. 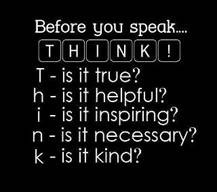 But more than that, I am more a firm believer in thinking before you speak. Scripture has a lot to tell us on that topic. What follows are a couple examples. Of course, what Guillén said pales by comparison to what passes for political discourse these days. If you watch television for a mere five minutes you’re bound to see a political ad that points out the failures of an opposing candidate in the vilest of terms. It always fascinates me that the majority of those ads say little if anything about the virtues of the candidates they support. Add to that the radio industry that has made millionaires out of loudmouths who spend several hours a day demeaning and degrading others in the most negative language conceivable. A colleague of mine posted the adjoining photo on Facebook which best summarizes the best course of action one should take before opening his or her mouth to speak. The ideas expressed are not new, but it is amazing how few of us consider them before speaking. Imagine what would be if we all took this advice and held others accountable for doing the same! I’ve thought about this often, just yesterday evening as a matter of fact. What does one do when the “other” is mean-spirited, controlling and uncaring. How do we warn others who ask about this “other” person? How do we craft our words and at the same time be honest regarding the “other”?